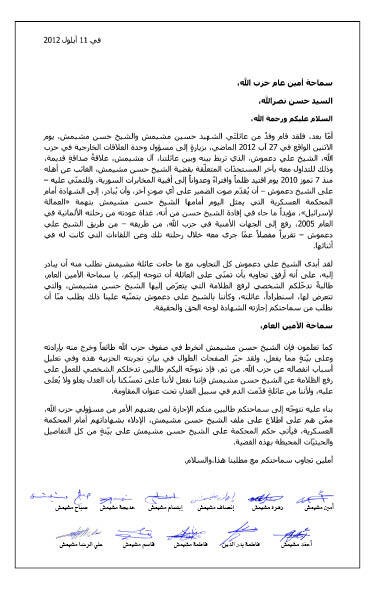 Letter to Hezbollah Secretary General Sayyed Hasan Nasrallah from the family of Sheikh H. Mchaymech. The seventh and most recent session of Sheikh Hassan Mchaymech’s legal battle took place on September 20, 2012. At that time, Reda, the Sheikh’s son and Abdul-Karim Mchaymech, Sheikh Mchaymech’s brother, were summoned as witnesses by the court. General Khalil Ibrahim, who presides over Lebanon’s Military Court in which Sheikh Mchaymech is being tried, also announced that new evidence had been submitted to the court regarding alleged telecommunications infractions by the Sheikh. Yet when lawyer Antoine Nehmeh asked to review the evidence against the Sheikh before continuing the trial, the judge abruptly suspended the proceedings until January 18, 2013. The Sheikh’s family also made public a letter to Hezbollah Secretary General Sayyed Hasan Nasrallah written September 12, 2012. Not only was the correspondence published September 13, 2012 in Beirut’s daily newspaper al-Balad and online in the Middle East Transparent, but it was also forwarded to Nasrallah via Hezbollah’s internal postal services. Sheikh Ali Damoush, head of Hezbollah's Foreign Relations Office and the newly established al-Zahraa compound in Dahiyeh, and a onetime colleague of Sheikh Mchaymech during his association with Hezbollah, informed the Mchaymech family last August 27 of “his desire to offer his ‘voice of conscience’ as a witness in the case against Sheikh Hassan Mchaymech.” He added that the testimony he wanted to give concerning Sheikh Mchaymech’s trip to Germany in 2005 “could serve as the basis for Sheikh Mchaymech’s exoneration.” Yet Lebanon’s Military Court—clearly under the influence of Hezbollah—continued to frustrate Mr. Nehmeh’s ability to defend the Sheikh effectively. Given that impasse (and after being advised accordingly by Sheikh Damoush), the family (comprised of eleven members including the Sheikh’s wife Fatima Badreddine and his son Ali al-Reda) chose to raise their concerns directly to the secretary general. Essay by Sheikh H. Mchaymech: "The Farce of my Arrest, Interrogation and Trial in the Syrian and Lebanese Prisons and Courts." Accordingly, we now turn our attention to you, [since you are responsible] for the actions of Hezbollah officials and their decisions. We kindly ask that you authorize whomever [sic] is in charge of the file regarding Sheikh Hassan Mchaymech to release this information and allow witnesses to testify on behalf of Sheikh Mchaymech in Military Court, thereby ensuring that the ruling [determined ultimately] by Lebanon’s Military Court is [...] based upon all the details and information regarding the case. On October 4, 2012, Sheikh Mchaymech’s lawyer Antoine Nehmeh submitted a motion to shorten the intervals between trial sessions; however, his request was summarily denied October 16. After meeting briefly with General Ibrahim, Mr. Nehmeh submitted a second motion on October 22, 2012, which was in accordance with the instructions he received from the judge. Yet while the general initially accepted the second request and rescheduled the eighth session to December 3, 2012, he recanted unexpectedly and inexplicably on November 6, 2012 and reinstated the original January 18, 2013 trial date. During the interval between hearings, the Military Court added two more charges to the case against Sheikh Mchaymech. The first related to Sheikh Mchaymech allegedly using a mobile phone while in Roumieh Prison. Notably, while it is illegal for prisoners to own and use cell phones within the prison, the practice is quite common. In fact, regular raids by prison guards turn up scores of phones; however, offenders are rarely if ever charged for their actions. The second charge had to do with a Majlis Aaza' recitation (a discourse on mourning) the Sheikh conducted to commemorate Ashura 2011 within Roumieh Prison. Although tensions between Sunni and Shia prisoners have escalated during the past year, that strife is unrelated to the Majlis. Nevertheless, the Military Court asserted that the event exacerbated sectarian strife among the prison population. 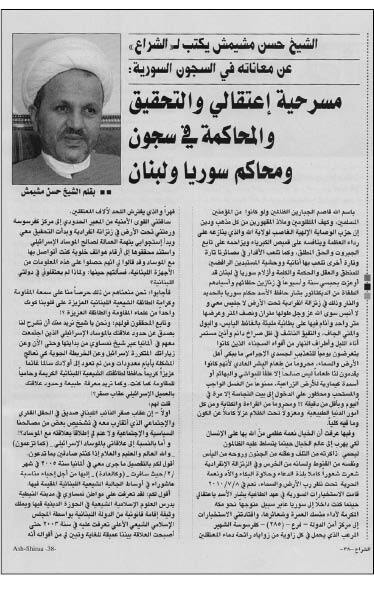 Also between court hearings, Sheikh Mchaymech released a new article entitled “The Farce of my Arrest, Interrogation and Trial in the Syrian and Lebanese Prisons and Courts.” The essay, published in two parts by ash-Shiraa on October 8 and 15, 2012, proves that despite the dangerous situation he is facing, the Sheikh indeed remains in command of his intellect. Further, his work demonstrates that none of the efforts made to silence him by Hezbollah and the legal community have thus far been successful.